Darkness stalks the halflings of this quiet and peaceful hamlet and the adventurers must decide whether to help the good residents or side with the forces of evil! 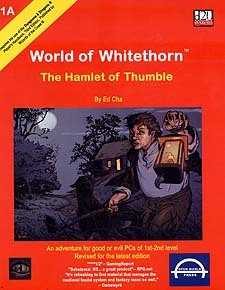 The Hamlet of Thumble is a basic adventure setting designed for a party of four to six good or evil player characters of 1st or 2nd level. The PCs are sent to The Hamlet of Thumble to find out why the halflings have been unable to pay their taxes to the local lord. Evil PCs are humanoid raiders ordered to steal as much as possible from the residents of The Hamlet of Thumble and hopefully cause enough havoc to force the halflings to leave. This band of miscrants comes from a tribe of evil humanoids that has settled nearby. The challenge for evil PCs is tougher because the halfling settlement is larger and more sopisticated than the evil humnaoid one. The evil PCs must avoid Thumble's powerful NPCs while doing as much damage as possible. Two groups of PCs can also work against each other - one party of good PCs protecting the hamlet and one band of evil PCs raiding it. There is an additional scenario in which two groups of evil PCs, a group of evil humanoid raiders and a group of evil mercenaries, act together to terrorize the halflings.